Axons of these neurons are long in comparison to their multiple short dendrites, viz. ‘Pyramidal Neurons’ of motor area of cerebral cortex, ‘Anterior horn cells’ of spinal cord , ‘Purkinje cells’ of cerebellum. Axons of pyramidal cells of cerebral cortex form long descending tracts passing through the spinal cord. Axons of anterior horn cells of spinal cord form long peripheral nerves supplying voluntary muscles. Purkinje cells axons form efferent fibers from cerebellar cortex to relay in cerebellar nuclei situated in its white matter. 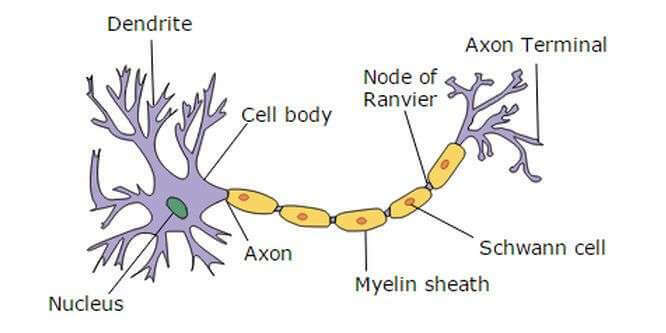 Axons of these neurons are short, similar to the length of the dendrites. Classical example of these neurons are stellate cells of cerebellar cortex, which have short axon and multiple short dendrites giving a star-shaped appearance. It forms synaptic connection with too many neurons. It is important to note that some of the neurons may have single long dendrite. For example, fibers present in the sensory nerves carrying sensory impulse from the periphery are the long dendrites of sensory neurons present in the posterior root ganglia of spinal nerve. These neurons carry sensory impulse from a receptor (sensory end organ) through the dendrite towards the center of nervous system finally through axon. From the sensory end organ or receptor situated at the periphery of the body, the sensory nerve impulse needs to pass through a chain of neurons as the relay system to reach the center of nervous system. The participating neurons in this “chain” are classified as primary, secondary and tertiary neurons. Primary sensory (First order) neurons: They start from the receptor or sensory end organ to enter the central nervous system. Their cell bodies are situated outside the central nervous system. Only exception is the cell group of mesencephalic nucleus of trigeminal nerve, whose cell bodies lie inside central nervous system. They are situated at the level of spinal cord which receive impulse from 1st order of neurons. Tertiary sensory (Third order) neurons: They relay the sensation from the secondary neurons to the final target, i.e. cerebral cortex. First group of these neurons are situated in the thalamus. The second or final group is situated in the sensory area of cerebral cortex. These neurons carry outgoing motor impulse from central nervous system to the peripherally situated effector organs which are either muscles or glands. In somatic nervous system—Upper motor neuron and Lower motor neuron. Upper motor neuron: These motor neurons are situated in motor areas of brain above the levelof spinal cord and brainstem (Midbrain, Pons and Medulla). Lower motor neuron: These motor neurons are situated in spinal cord.